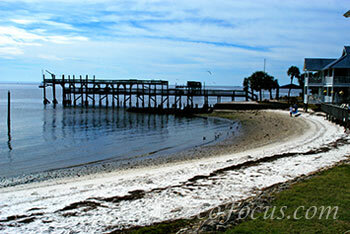 You’ll find this remote, quiet island on Florida’s gulf coast north of Crystal River. As you drive west on route 24, civilization falls away and it appears that the clock is running backward. The last part of the trip takes you past salt marsh islands. It is is a good idea to find a place to park and then walk through the small island community to visit the shops and scout your next seafood meal at one of the local restaurants. 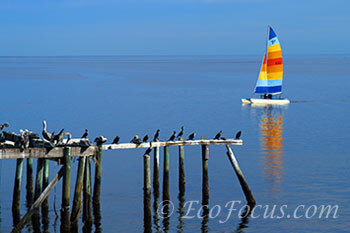 Because of its location and appearance, Cedar Key exudes calm, charm and cuteness. With its laid-back atmosphere, it may be hard to imagine that Cedar Key was once a thriving port, an industrial center, and a terminus on the first railroad to cross the state, which stretched all the way to Amelia Island on the east coast. By the early 1900s, Cedar Key’s industrial importance dimmed and fishing became an economic mainstay, followed by tourism. Aside from eating, walking and gawking, there are opportunities for kayaking, sailing and other water sports. Seabirds are abundant and bird watching is very popular. Several fine beaches invite relaxation. Boaters can make use of a public marina. And of course, fishing is very popular.When stopping at Cedar Key on a winter day, I was surprised to see the large number of other visitors that were there. We watched the colorful sailboats, sampled the seafood and hung out with the pelicans and cormorants occupying prime spaces along the docks and waterside buildings. For a glimpse at the history of Cedar Key, visit the St. Clair Whitman house in one of Florida’s smallest state parks. The house has been restored to represent life around 1920.